Fleas and ticks can get out of control very quickly and generally it's not your fault. 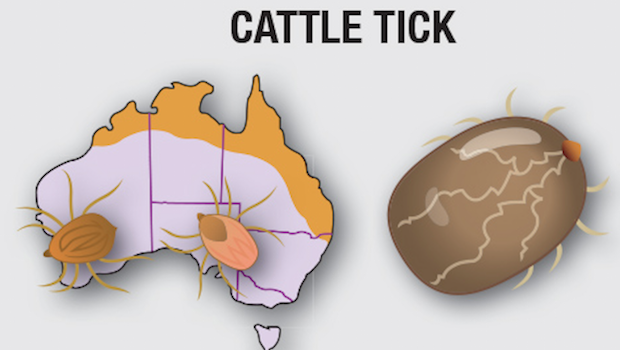 It's simply the humid climate we live with in Cairns and in a lot of cases a misunderstanding of the breeding nature of these pests. Fleas and ticks rapidly reproduce and they can only be effectively dealt with by professionals that understands the biology of these pests. 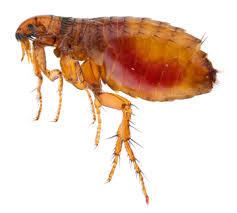 We now experience more tenants being require to treat for fleas and ticks at the end of their lease. If a rental vacate treatment is require, SR Pest Control can help you get back your bond. It is best to schedule your end of lease pest control after all cleaning is completed, as mopping of floors or steam cleaning of carpets will strip our treatment away. We advise a general tidy of the premises. Picking up all bits and pieces up off the floor inside giving plenty of floor access to the pest controller. Vacuuming and mopping is recommended so the product can adhere to surfaces giving maximum results. Mow your grass the day before treatment to allow full coverage of insecticide. It is important to wash pets with an appropriate flea control wash. Then administer pills,chews or fasten a tick and flea collar to break the cycle and provide long lasting control. Clean out your pets sleeping quarters and wash all pets bedding to reduce flea and tick numbers. A adulticide and larvicide are mixed in our treatments to act against the larvae stage completely breaking the cycle giving you, your family and pets relief. All our products are safe for occupants and their pets and SR Pest Control runs a comprehensive service warranty. You will begin to see results after 1-2 days. It is important not to mow your yard for 7 days and not watered for the initial 4-5 days. To allow our treatment to take effect. Keep up with 'on' pet treatments and regularly wash pets bedding. 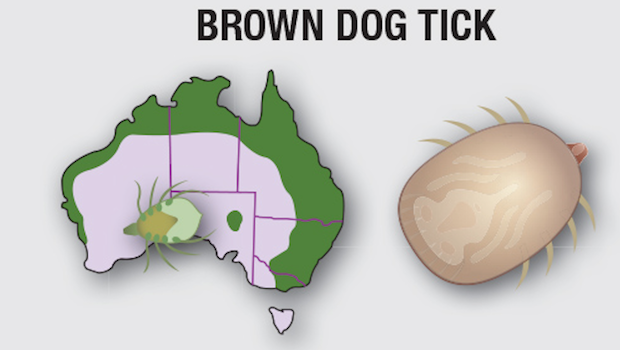 Brown dog ticks are an introduced species and known for transferring ‘Q Fever’ a type of typhus disease. 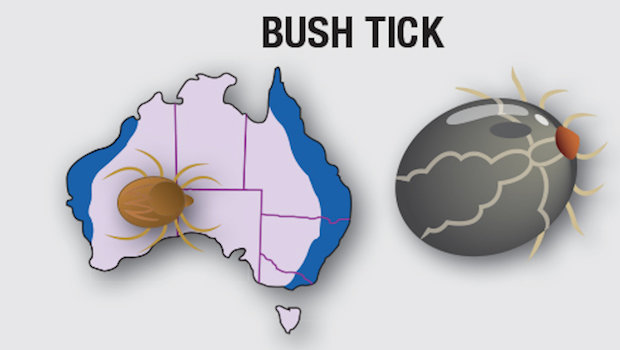 As female ticks feed, they become engorged and swell to a grey-blue or olive colour. Legs are dark red-brown colour, first pair of legs very close to the mouth. Snout sort and wider at the face. Pale cream legs, first legs are spaced far away from the snout. 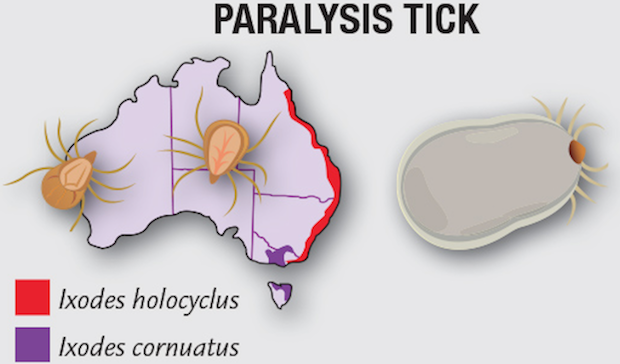 The Paralysis tick is most abundant on the coastal plains of Queensland. It causes paralysis by injecting neurotoxins into its host. First and last pair of legs are darker brown in colour. Hard flat body and elongated mouthparts. Yellowish-grey to grey with dark bands on the sides. When fully engorged, it is grey-blue in colour up to around 1cm in length.